COCO has excellent animation. One only has to sit back and concentrate on the details to notice the painstaking efforts made to produce the marvel that is witnessed on screen. Disney had a presentation before the press screening of COCO to show how some of the animation was done and planned through one of COCO’s Canadian animators from Burlington, Ontario. One shows petals dumped into Miguel (the film’s protagonist) mouth and his spitting them out, his tongue coming out twice from his mouth. This is shown in real life how a person would do it, followed by the animation and how the animation was improved by the director’s notes. The same was demonstrated with the loose skin under Mama Coco’s jaws and arms. As the saying goes: The devil is in the details. Beside the animation details, the keen observations made in real life projected as animation on the screen also creates the magic of Disney. The main character is Mama Coco in the film, who is losing her memory from Alzheimer’s and bound to a wheelchair. Yet whenever, she is moved around, she received a kiss on her cheek by Miguel or by her daughter in the film. This kiss works wonders in affecting audience emotions as everyone will come across an aged relative at one time or another who will be losing his/her memory. Other magical moments, important in an animation tale include the real magic in the story. In COCO, there is the crossing of the two worlds of the living and the dead. It is a clever twist on Mexican legend of the festival of the dead. COCO plays like a fairytale, Mexican style without the snow, ice and royalty. But there are still the classical elements of a fairytale like a long journey to be made, magic, a faithful animal (a smart street dog) and a quest (to find music). The dialogue based on the script by Adrian Molina and Matthew Aldrich contains many quotable lines like: “Never estimate the power of music”; “Got to have faith in your dream” and “Grab your dream and make it come through’, to list a few of many. Miguel is forced to make the choice of music when confronted to decide between music and family, for that is where his heart is. He learns later through his idol Ernesto de la Cruz, that the singer is not all that he makes out to be. It is a sweet story of truth and the film completes Miguel coming-of-age and rites-of-passage as he is forced to correct a wrong. Despite all the feel-good moments and magic, COCO has the element of death throughout. Miguel crosses into the land of death. His great grandmother, Mama Coco is at the point of dying. Music is also dead in Miguel’s family. Skeletons and dead people are always around Miguel. The magic question now is how successful at the box-office COCO will be. Will it beat its toughest challenger FROZEN? 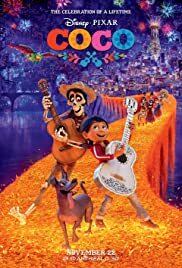 COCO is a Mexican based story compared to FROZEN’s all white caucasian fairy tale. COCO is the best animated feature this year.